Welcome to my Monday Blog—I’m glad you’re here! If being alive is all I’m doing with my gift of Life, then I’m taking an awful lot for granted. Where’s the happy in that? Oh sure, we must start with being alive, but after that, we have so much to do if we’re truly going to live! Living is all about experiencing. What makes us happy? How do we Get Happy, anyway? Granted, we don’t have the luxury of a crystal ball to see the future…but we do have a surefire, awesome road map to guide us on what to do, how to do it and when to do it— Yep: The Bible! Plus, it includes some very specific guidelines to follow every day of our lives: The Ten Commandments. For me, to Get Happy means living my life as a disciple for Jesus. Obviously I can’t fulfil all the instructions He gave the disciples that day before He left them for Heaven, but I can do my part in sharing my love and devotion for Him. I can live my life in a state of full-on happy in His holy name! I can be a light for Him in a state of happiness, in hopes of pleasing Him and thanking Him for giving His precious Life for mine. I am weak but He is strong and I make so many mistakes, but He forgives me and shows me how to get back up and do that Happy Dance once again, and again. The joy and happiness which exists in living a Christ-centered life is just simply awesome! I don’t know what else to say except maybe this: If you truly want to Get Happy, then GET JESUS!! Amen. This entry was posted in Uncategorized on July 24, 2017 by Author Margaret McBride. Besides her eight Grammy wins, having penned over 5,000 songs, recorded 25 #1 hits, and performing several acting gigs, Dolly’s claim to fame may in fact be her good works, (which most of the time goes unnoticed, except for her blessed recipients). Her Imagination Library, established in 1995 has sent more than 85 million books to kids in the U.S., Canada and the U.K. And there there’s Dollywood, the 150-acre family destination, ranking among the “best of the best” in theme parks, located in the foothills of the Great Smoky Mountains in Pidgeon Forge, TN. So last year, when the wildfires in her Great Smoky Mountains got wild, she got busy! Dolly’s Dollywood Foundation gave $1000 a month for six months to every family (more than 900) who lost their home. When I read an article about this over the weekend, I felt a tug on my heartstrings and was reminded of a few other individuals who are also blessed as Dolly…and they too, see with their hearts. These are folks who want nothing in return—they choose to give, not take; help, not hurt; be in, not out; lift up, not tear down; build, not break; listen, not lie. When one is in need, these folks run to, not away. Simply put, these folks are Good Samaritans and truly, indeed, see with their hearts. Today, I honor Dolly Parton—no doubt a humble Good Samaritan, who wants nothing in return for all the incredible good she creates not just here, but all over the World. She has touched the hearts of so many, for so long now, and today I see her with my heart. Thank you, Dolly and may God continue to bless you in His glorious ways! Amen. This week, my friends, please, let’s all be conscious of this and as we go about our daily lives, let’s see with our hearts. This entry was posted in Uncategorized on July 17, 2017 by Author Margaret McBride. Welcome to my Monday Blog, Everyone!! Of course—we all have! 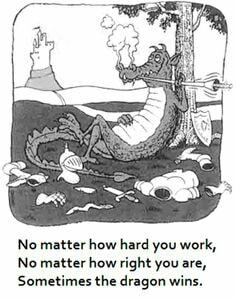 Sometimes the dragon wins – the battle, but not necessarily the war! I choose to believe that is the precise moment we realize what we’re made of—Are we cowards or courageous!? Which is it? None of us is immune to the dragon. He comes in many forms—to slay us, our hopes and our dreams. Between you and me, I choose to fight that “dragon” till there’s no fight left in me, and there’s no one better to fight my battle for me than me. I know what ‘s at stake and how dear it is to me, and noone will fight harder for me than me! Yep, I talk big, don’t I? Well, when one has Faith, in a superior being—it sure makes Life’s challenges a whole lot easier to bear. Remember, David and Goliath? Goliath may as well have been a dragon to David; however, David rose to the occasion and with a small sling shot and a stone, David slew his dragon…right then and there, without anyone’s help—just him and his faith. David had no armor, no experience, no equipment, he was not battle tested, nor was he trained. But one thing he had that Goliath also had was confidence; however, the huge difference was that David’s confidence was in His God and not in his own strength. David’s faith and confidence was not in himself, his buddies or in anyone else – but God. The story of David is only one of many, we have which tells us of the peace and happiness we can achieve in our daily lives as we live our gift of Life here on Earth. This depiction also shows us how scary Life can get sometimes, but more importantly, how our faith in our Heavenly Father can help us slay our dragons. Amen. This week, let’s all test our faith and put on our shields of salvation. Let’s allow God to work through us, as His gentleness makes us great! Let’s all pray for one another as we know not the trials each other faces. Hallelujah!! This entry was posted in Uncategorized on July 10, 2017 by Author Margaret McBride. Welcome to my Monday Fourth of July Blog! Let’s talk about FREEDOM. What is freedom, anyway? Freedom; noun: the power or right to act, see, or think as one wants without hindrance or restraint; the state of not being imprisoned or enslaved. I feel safe in saying that our beloved America still holds this to be true; however, it is also true that for the past several years there has been something quite ominous lurking around the globe and America cannot escape its’ clutches. People truly hate us for what we stand for in this country. We’re hated for almost everything, especially our Christian faith and values. It’s hard to believe, but it’s true. Also, it appears that within our own country, we are rotting from the inside out —so much hate-mongering and descent – the political parties are fighting each other and even within their own parties. It appears that folks don’t feel the need to agree to disagree and work together for the better of our America The Beautiful! If we continue on the present path of descent, greed, lies, road blocks and scandals, we may end up with such a facelift in our beautiful land of the free and home of the brave, that when it’s all over but more shouting, we may not even recognize our once awesome America and what she stood for in the face of adversity. Oh and let’s remember, America was once a beacon not for just us Americans, but for the entire World! United we stand, divided we fall. So tomorrow, wherever you are or whomever your with, take a few minutes and think about what this awesome USA means to you and ask yourself this: Would you prefer to live anywhere else in this World? If we ever needed to PRAY AND NEVER CEASE, it’s now. This week starting tomorrow, July 4, 2017, let’s all begin a prayer for a United States of America, once again. You know, I believe in the Power of Prayer, whole-heartedly and unashamed. I know, first-hand, how powerful prayer can be. It also moves us intimately closer to our Lord and Savior —This pleases Him. Amen! This entry was posted in Uncategorized on July 3, 2017 by Author Margaret McBride.